This article is about a genus of southern African bulbs. For the South American and winter-flowering houseplant commonly sold as "amaryllis", see Hippeastrum. For other uses, see Amaryllis (disambiguation). Amaryllis (/ˌæməˈrɪlᵻs/) is the only genus in the subtribe Amaryllidinae (tribe Amaryllideae). It is a small genus of flowering bulbs, with two species. The better known of the two, Amaryllis belladonna, is a native of the Western Cape region of South Africa, particularly the rocky southwest area between the Olifants River Valley to Knysna. For many years there was confusion among botanists over the generic names Amaryllis and Hippeastrum, one result of which is that the common name "amaryllis" is mainly used for cultivars of the genus Hippeastrum, widely sold in the winter months for their ability to bloom indoors. Plants of the genus Amaryllis are known as belladonna lily, Jersey lily, naked lady, amarillo, Easter lily in Southern Australia or, in South Africa, March lily due to its propensity to flower around March. This is one of numerous genera with the common name "lily" due to their flower shape and growth habit. However, they are only distantly related to the true lily, Lilium. Amaryllis is a bulbous plant, with each bulb being 5–10 cm (2.0–3.9 in) in diameter. It has several strap-shaped, green leaves, 30–50 cm (12–20 in) long and 2–3 cm (0.79–1.18 in) broad, arranged in two rows. Each bulb produces one or two leafless stems 30–60 cm tall, each of which bears a cluster of two to twelve funnel-shaped flowers at their tops. Each flower is 6–10 cm (2.4–3.9 in) diameter with six tepals (three outer sepals, three inner petals, with similar appearance to each other). The usual color is white with crimson veins, but pink or purple also occur naturally. The single genus in subtribe Amaryllidinae, in the Amaryllideae tribe. The taxonomy of the genus has been controversial. 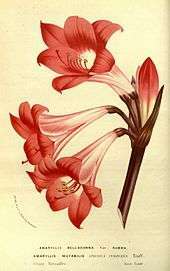 In 1753 Carl Linnaeus created the name Amaryllis belladonna, the type species of the genus Amaryllis. At the time both South African and South American plants were placed in the same genus; subsequently they were separated into two different genera. The key question is whether Linnaeus's type was a South African plant or a South American plant. If the latter, Amaryllis would be the correct name for the genus Hippeastrum, and a different name would have to be used for the genus discussed here. Alan W. Meerow et al. have briefly summarized the debate, which took place from 1938 onwards and involved botanists on both sides of the Atlantic. The outcome was a decision by the 14th International Botanical Congress in 1987 that Amaryllis L. should be a conserved name (i.e. correct regardless of priority) and ultimately based on a specimen of the South African Amaryllis belladonna from the Clifford Herbarium at the British Museum. The name Amaryllis is taken from a shepherdess in Virgil's pastoral Eclogues, (from the Greek ἀμαρύσσω (amarysso), meaning "to sparkle") and also from "Amarella" for the bitterness of the bulb. Although the 1987 decision settled the question of the scientific name of the genus, the common name "amaryllis" continues to be used differently. Bulbs sold as amaryllis and described as "ready to bloom for the holidays" belong to the allied genus Hippeastrum. The common name "naked lady" used for Amaryllis is also used for other bulbs with a similar growth and flowering pattern; some of these have their own widely used and accepted common names, such as the resurrection lily (Lycoris squamigera). The common name "naked lady" comes from the plant's pattern of flowering when the foliage has died down. There is an Amaryllis belladonna hybrid which was bred in the 1800s in Australia. No one knows the exact species it was crossed with to produce color variations of white, cream, peach, magenta and nearly red hues. The hybrids were crossed back onto the original Amaryllis belladonna and with each other to produce naturally seed-bearing crosses that come in a very wide range of flower sizes, shapes, stem heights and intensities of pink. Pure white varieties with bright green stems were bred as well. The hybrids are quite distinct in that the many shades of pink also have stripes, veining, darkened edges, white centers and light yellow centers, also setting them apart from the original light pink. In addition, the hybrids often produce flowers in a fuller circle rather than the "side-facing" habit of the "old-fashioned" pink. The hybrids are able to adapt to year-round watering and fertilization but can also tolerate completely dry summer conditions if need be. A. belladonna has gained the Royal Horticultural Society's Award of Garden Merit. Amaryllis belladonna has been crossed in cultivation with Crinum moorei to produce a hybrid called × Amarcrinum, which has named cultivars. Hybrids said to be between Amaryllis belladonna and Brunsvigia josephinae have been called × Amarygia. Neither hybrid genus name is accepted by the World Checklist of Selected Plant Families. 1 2 3 4 "Amaryllis belladonna (March lily, Belladonna)". Biodiversity Explorer. Retrieved March 4, 2013. ↑ Mike Campbell. "Behind the Name: Meaning, Origin and History of the Name Amaryllis". Behind the Name. ↑ Adams, T (March 2001). "Amaryllis belladonna L.". Plantz Africa. Retrieved March 4, 2013. ↑ "Amaryllis belladonna L.". Australian Plant Name Index (APNI), IBIS database. Centre for Plant Biodiversity Research, Australian Government. Retrieved 4 March 2014. ↑ "RHS Plant Selector - Amaryllis belladonna". Retrieved 21 May 2013. ↑ "Pacific Bulb Society - ×Amarcrinum". pacificbulbsociety.org. ↑ World Checklist of Selected Plant Families, The Board of Trustees of the Royal Botanic Gardens, Kew, retrieved 2011-11-28 , search for "Amarcrinum" and "Amarygia"
Wikimedia Commons has media related to Amaryllis. Phipps, Nikki (9 February 2011). 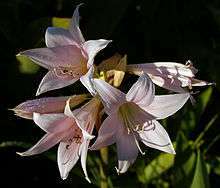 "Amaryllis Belladonna Planting – How To Grow Amaryllis Bulbs". Planting Flower Bulbs. Dyer, R. A. (1954). "The Cape Belladonna Lily". Taxon. 3 (2): 72–74. doi:10.2307/1217368. JSTOR 1217368.